Engineered for exterior and rooftop applications, Q Duct™ requires no additional weatherproofing or insulation. System is custom-fabricated using 2 layers of rigid UL 181 Pal phenolic core material, faced on both sides with coated aluminum and exterior multilayered laminate jacketing material. Interior and exterior layers resist mold, mildew, UV, and extreme weather conditions. Delivered preassembled to jobsite, Q Duct does not emit VOCs or toxic gases and contains no microfibers, CFCs, or HCFs. 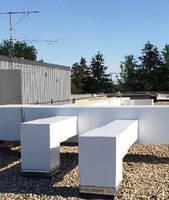 SHOREVIEW, Minn. -- AQC Industries introduces Q Duct™ Outdoor Preinsulated Duct System, which is engineered for exterior and rooftop applications. Constructed to withstand harsh weather conditions in all climates, this rugged outdoor air-duct system saves energy, space and labor. Q Duct is custom fabricated using two layers of rigid UL 181 Pal phenolic core material, faced on both sides with coated aluminum and an exterior multilayered laminate jacketing material. Self-insulated, this outdoor duct requires no additional weatherproofing or insulation and eliminates the need for an insulation subcontractor. Q Duct sections are delivered preassembled to the jobsite, ready for installation by a certified contractor. The product installs easily in a fraction of the time of traditional duct. Q Duct is made of PalDuct phenolic core panels which meets UL 181, ASTM E84 flame and smoke standards. The interior and exterior layers resist mold, mildew, UV and extreme weather conditions. Q Duct does not emit volatile organic compounds (VOCs) or toxic gases and contains no microfibers, chlorofluorocarbons (CFC) or hydrochlorofluorocarbons (HCF). AQC Industries provides engineering and CAD services to meet specific application requirements. Q Duct is sold through a nationwide network of knowledgeable representatives and is manufactured using environmentally friendly practices. Virtually maintenance free, the product is lightweight and durable for quick and easy installation. Backed by an industry-leading warranty, Q Duct can contribute to LEED® points. For additional information, email team@aqcind.com or call 1.877.783.1520 or +1 652.209.0050. To find a representative near you, visit www.aqcind.com. AQC Industries’ products, Q Duct, PalDuct and The BlueDuct®, have revolutionized air-duct systems for commercial, industrial and residential applications. AQC’s products are advanced alternatives to fiberglass and metal ductwork with many benefits, including energy and labor savings. AQC engineers, technicians and representatives work closely with customers to provide consistent high-quality CAD services and contractor training. AQC’s underground, outdoor and indoor air-duct systems are offered through knowledgeable distributors and representatives throughout North America. Conduit and Fittings suit outdoor, all-weather applications.